Lorenes Laboratory: Appreciation for Music in Africa! The Last day of graduation rehearsals we had a staff talent show, where many of our EHS staff shared talents that they had through music and performing arts, thank you to miss Hansen for the beautifully played and sang song on the piano, another piece of music that kinda of got stuck in my mind was this piece performed by two teachers, Mr. Friend and Miss Smith. It is a song that originates from Africa, it was played on a Mbira, the song is very primitive, repetitive, and some what stream of consciously, from what i understand after talking to Mr. Friend. thus being very hypnotic and beautiful to me. Thank you for asking and thank you for the compliment. It was a pleasure to play for you guys. Sorry I haven’t responded sooner—I was out yesterday. The instrument is called an mbira. 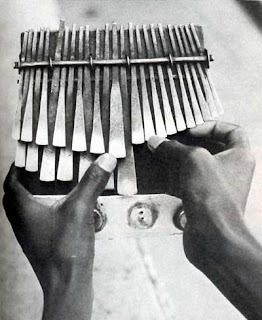 It is a type of instrument (which Americans often call a “thumb piano’) which is found in many different parts of Africa with different names depending on which country or region the specific instrument is found. These instruments can vary a lot in size, range, pitch, and number of keys. The one I play is from the country of Zimbabwe and the music I play is from the Shona people, ne of the ethnic groups in Zimbabwe. The song I played is called “Chemutengure”. The song dates from a time in the early 1900’s when white European people were moving into areas of Southern Africa. My teacher used to say that this song represents the acknowledgement on the part of the African people, that due to this European immigration, life would never be the same as it was before for the African people—for better or worse their cultures were going to mix and something new would be born, but there would be no going back to the past. There is some improvisation, but it is limited within a certain song structure. Also it is common for singers to improvise lyrics to mbira songs, taking a traditional theme and adapting it to some current event. My improvisation was limited to singing syllables that don’t have a specific meaning, because I don’t really speak Shona language. Thanks for asking. I hope you find more of this music in the future. Actually you can find many mbira players both from Zimbabwe and from the US on You-Tube & you can hear their pieces. Enjoy!